Endotricha mesenterialis represents one of the 10 Endotricha species in Taiwan and shares very similar wing pattern with E. olivacealis. It is hard to distinguish E. mesenterialis from E. olivacealis by just a simple photo, and the genitalia comparison is necessary for identification. Whalley PES, 1961. 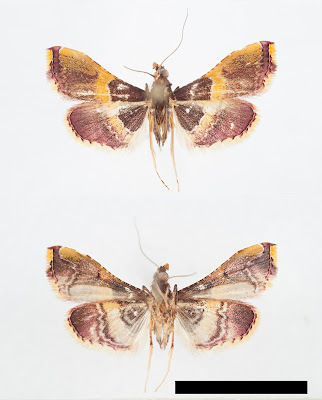 A revision of the world species of the genus Endotricha Zeller (Lepidoptera: Pyralidae). Bulletin of the British Museum of natural History (Entomology) 13(11): 395-454, pls. 1–37.